It’s hard to believe that the Google Hangouts (GHOs) feature has only been around since May of 2013! For many innovative K-12 and higher education teachers, GHOs have become a tool that we can't live without. They allow us to connect with others around the world for impromptu meetings, live podcasts, global edcamps, and school-wide professional development. Google Hangouts are highly utilized in the edtech community, but Hangouts on Air have increased in popularity due to their ability to broadcast live discussions publicly on YouTube. Hangouts on Air can be recorded and automatically saved on the host's YouTube channel for future access. Up to ten people can participate in a Hangout on Air, but the number of viewers who can watch the live Hangout is unlimited. 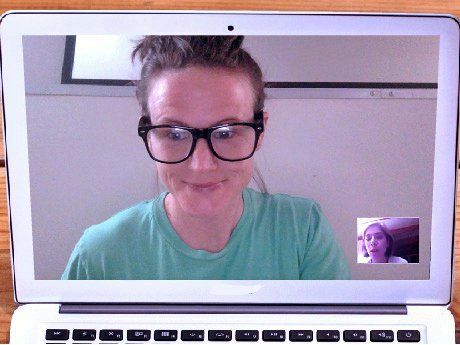 With school budgets dwindling each day, Hangouts on Air have allowed educators to grow professionally by connecting to experts from anywhere in the world -- with no travel costs required. I have used Google Hangouts since the tool was first released, but my initial exposure to a Hangout on Air was during edcamp Home. Edcamps are typically held on school campuses, but edcamp Home allows you to connect with great minds in education from the comfort of your own home -- PD in your PJs! The organizers of edcamp Home completed their third event in July 2014. They work extremely hard to put this fabulous event together, an event that wouldn't be possible without Hangouts on Air and Google Docs for brainstorming sessions and scheduling. Having attended traditional edcamps in the past, what I love most about the "Home" option is that I don't feel as bad about popping in and out of sessions as I do in person. Even though you're encouraged to leave a room if you aren't "feeling" it, I still find it uncomfortable to up and leave in the middle of a face-to-face discussion. Edcamp Home eliminates this feeling of guilt because no one really notices when you pop in and out. When I began planning my school’s 1:1 iPad and Mac deployment last year, it spurred me to first create a professional development plan with my team. Focusing on SAMR and TPACK, our PD options have included face-to-face Tech Tuesday sessions and virtual options found in our iTunes U course, "iInnovate: Teaching and Learning with Tech." The PD options met most of our teachers' needs, but our math teachers needed something more. I'd taught third grade math for many years and could provide tech tools for math instruction, but I couldn’t give high-level examples other than what I had observed from colleagues in the field. So I contacted my friend Anthony DiLaura, a colleague from the Apple Distinguished Educators program and an innovative, globally-recognized math educator who uses 1:1 iPads with his students at Zeeland East High School in Zeeland, Michigan. I asked Anthony if he'd be interested in supporting my math teachers in their professional learning goals by offering them an alternative to our Tech Tuesday sessions. Tony, being the amazingly kind and collaborative educator he is, agreed to host monthly "Math Hangouts on Air" so that my math teachers could join a PD session any time, anywhere and focus on professional learning that met their needs. These Hangouts have been highly successful and wouldn't be possible without the free Google Hangouts on Air tool. Jenny: When did you hold your first Snow PD Day on Air? Tara: Our first Snow PD Day on Air occurred in January, a couple of weeks after returning from Winter Break. Jenny: How did you get teachers to participate? Was it mandatory? Tara: The Snow PD Day on Air was mandatory, as we had already missed four academic days, and our administration wanted to ensure that the communication with and development of the staff was being sustained. I had met virtually with our instructional coaches to guide them through the setup of the Google Hangout that they would have with their respective grade-levels. In turn, the coaches were able to walk their teachers through this process the evening before the Snow PD Day on Air. Jenny: What was the agenda covered? Tara: With high-stakes testing coming up, the majority of the agenda was focused on evaluating the data gained from previous tests. During the Snow PD Day on Air, teachers were able to develop shared plans and strategies to use in their classrooms, as a way to support their varied learners. Jenny: How have the teachers responded to this PD option? Tara: Teachers found more comfort in this form of PD than in the physical, sit-and-get form. Interacting with coaches in an informal, virtual setting helped teachers to feel comfortable in asking questions, as they could post a question in the chat box to have a backchannel going on during the presentation. The presenter can also see this chat backchannel, which makes it easier to clarify any misunderstandings. One of the best features of our Snow PD Day on Air was the ability to share one's screen with the group. Also, with the ability to collaborate on files that live in Drive, teachers found that they were able to get much more group work done virtually than they would had they worked on an activity in person. Jenny: Has the trend continued with success? Tara: This Snow PD Day on Air trend has continued with great success since its inception. Now, teachers use Google Hangouts to collaborate virtually even on the regular old snow days. With Google Hangouts, these virtual connections have become a natural part of many of our teachers' PD. To learn more about broadcasting a GHO, Alice Keeler has provided directions. For more GHO ideas, check out Mary Beth Hertz' How Educators and Schools Can Make the Most of Google Hangouts.